...Her Name was Beatrice Alexander Madame Alexander Dolls Beatrice Alexander was respectfully referred to as the queen of doll manufacturers, Madame Alexander was literally "born" into the business. As stated in "Madame Alexander Dolls Collector Dolls" by Patricia Smith, Beatrice Alexander was born above "the first doll hospital in the United States." Her love of beauty and desire to capture childhood in the image of a doll led to her first creation. "During World War I...Beatrice created a little Red Cross Nurse doll and a baby of cloth". In 1923 Beatrice and her three sisters worked together to produce in quantity the doll created in the image of her daughter Mildred. Thus, the commercial doll company became The Alexander Doll Company and the beginning of the Madame Alexander Dolls legend. Beatrice enticed her husband to accompany her in the venture and "together they built a company beyond their dreams." 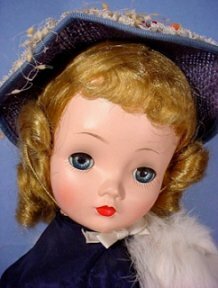 Beginning with the 7 1/2 to 8" "Tiny Betty" (circa 1935) through the later years of composition (circa 1948), the Madame Alexander composition dolls evolved into popular, high-quality images of beauty. 1937 seems to be the launch pad of her most beautiful creations. 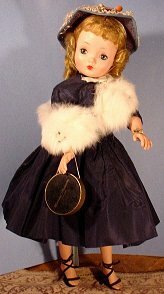 "Princess Elizabeth," a doll with a child-like facial structure, was offered in sizes from 13" through 27". The doll was released at the time of the Coronation of King George VI (the father of Princess Elizabeth). 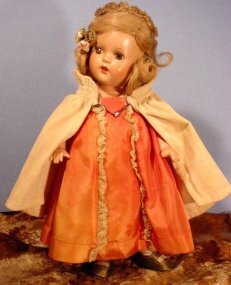 The mold of the "Princess Elizabeth" doll was used for other composition dolls in the following years. Kate Greenaway, Princess Margaret Rose, Babsie Skater, McGuffey Ana, Cinderella, Flora McFlimsey to name a few. There were trunks and wardrobes of extra clothing available. Some clothing was tagged. A lot was not. The composition girl that I find most appealing is the beautiful "Wendy Ann" or "Wendy." 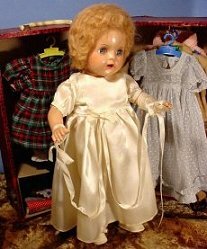 Released in under many names, the doll that I sought the longest, and the most diligently was the "Wendy Bride." (Circa 1937-1948). Given to me at Christmas, by my father who was in the Philippines at the time, I had this lovely bride with me until my early adult years. It was only after reading the many letters written to my grandmother from my father during the War that I discovered that he had instructed my aunt to purchase the doll for me. Makes sense to me now. 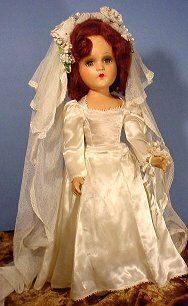 I am sure the Philippines during World War II was not the ideal place to purchase a Madame Alexander doll, much a bride doll! Through circumstances beyond my control, she had been lost, and I thought that it was forever. 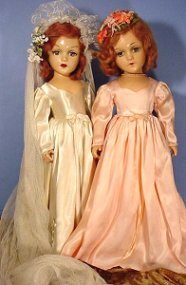 But, we seldom forget any detail of the dolls we loved as a child. I had very clear, exact memories of her dress and veil. Many years later, the search was over. My husband had driven me 300 miles to a doll show. He waited in the car while I ran in "for a few minutes." He was probably shocked to see me exit in the exact stated "few minutes," as my long lost Madame Alexander doll was standing on the first table I had approached. Not even looking at the price, I had purchased her and left the building. 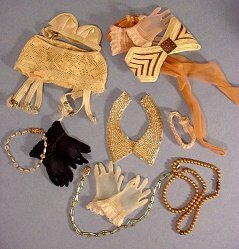 The much-anticipated doll show had lost its appeal as I had obtained the treasure I had been searching for. Madame Alexander also created many other beautiful Wendy Brides. The Wendy's face is slender and pensive. Large eyes and a soulful look, she is a breathtaking doll. Of course, through the years, many other brides have attended the large wedding reception going on at this location. 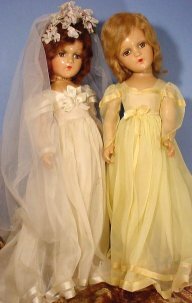 Once you acquire a Madame Alexander Bride doll, she must have Bridesmaids. The bridesmaids' dresses are of the same design as the bride, only co-ordinated in pastels. Indeed the most sophisticated creation of the Madame Alexander Dolls. Cissy's debut was in 1955. The Cissy's face had been used before on Binnie Walker, but, now she was a young lady with arched feet that wore high heels and had arms that could be positioned easily to display her many purses or carry her personalized hat box. A "glass" counter to display her undergarments and girdles are a project for the future. The department store will have to expand to the mezzanine to accommodate more accessories...and then there should be a display just for hats! Probably the best place to look for the present "doll and accessories" value is on the Internet, primarily the auction sites--my favorite is eBay. 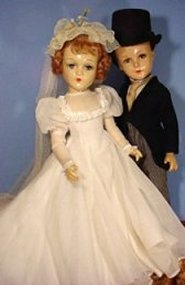 In the completed, Madame Alexander Dolls section of eBay is where you can browse the past 30 days of completed auctions of Madame Alexander dolls and accessories. On the left side, in the box named "Display," you can select "Active Items" to see the "Madame Alexander dolls and accessories" presently up for auction. Welcome to "Show and Tell" for early Madame Alexander Dolls! We all love to share. 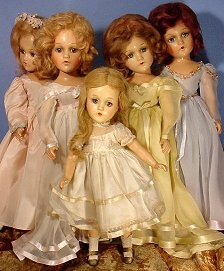 If you have photos and information on these lovely early Madame Alexander dolls, please fill in the form below to "Show and Tell" your favorite Madame Alexander Doll. My very own Cissy doll and all her outfits.